Today we visited St. Patrick's in Brantford and we had a fantastic time. They sent us some questions and I thought I would answer them here. Hello and thank you. We had a great time today learning about Native dance and singing. The class have a few questions for you. 1. How did you learn to make your outfits? Are there different outfits for different dances? I learned how to make the outfits mostly by trial and error. I watched my grandmother and great aunt sew and asked questions of people who knew how to bead. I would inspect other people's beadwork and try to figure out how it was done. It took me many years to learn how to sew and bead and there is always something new to learn. Yes, there are different outfits for different dances. 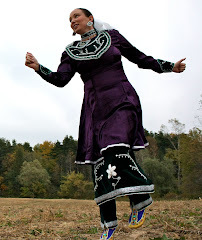 Today we shared the fancy shawl as well as the grass dance but there are many many other dance styles with dance outfits to go along with them. 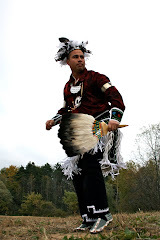 For example, the Mens and women's Traditional dances, The Jingle dress dance and The Men's Fancy Feather dance. 2. How did you learn to dance like that? I learned by watching and emulating (trying to copy) my favourite dancers. 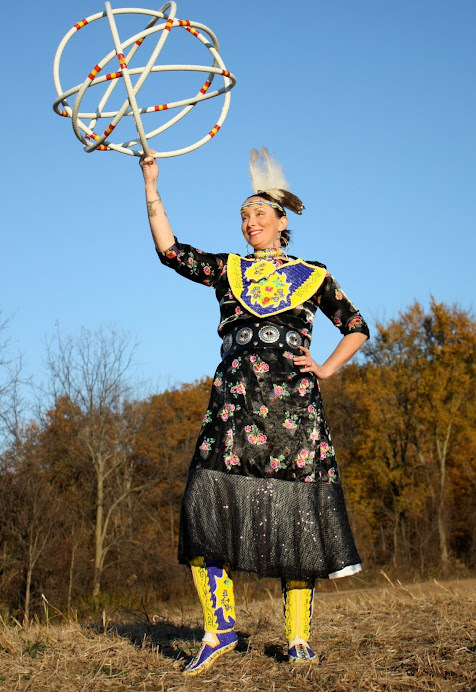 When I would get home from the powwow or social I would practice for hours in our family room. We don't have dance schools for this we learn by watching our elders. 3. How did you learn to sing like that? Does it hurt to sing so high? I learned from a Lakota elder named Lou Foot when I was seven years old. Yes, it does hurt at times especially when you over do it. I use herbal teas to soothe my throat and I rest my voice when I can. 4. Do different songs go with different dance styles/moves? Yes, different songs go with different dance styles. We can tell what style of dance goes to which song by the tempo, beat and vocal melody that we hear. 5. Are any other instruments other than the drum used in dance? Yes, there are other instruments other than the drum used in dance. For different types of dances you might hear a variety of rattles made from such materials as gourd, shell or horn. You also might hear shakers or bells on the dancers that accent and become part of the song. I hope this answers your questions. Thank you so much for taking the time to write to us.